This May, we’re celebrating our Desk Angel and Teacher Training graduate, Claudia! 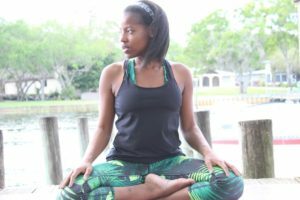 See why she practices and barters at Bella Prana. 1. How has yoga and meditation changed your life? I love how physically good to the body it is! For instance, I started running a few years ago and ALWAYS ran out of breath (AWALYS). Since I started yoga my breathing has enhanced my physical abilities in a way that is unexplainable. All of a sudden, I’m willingly doing 15k races! Just Breathing? YES! Just that! I also love that I can now create space for someone to breath, be still, meditate, and build strength all in the same room. I walked into a yoga class at USF for the first time in 2013, and felt all those things in one class. How amazing it is that I can invite others to experience the same thing (or more!). 2. Why do you barter at Bella Prana? Bella Prana is where I earned my Yoga Teacher Certification. I gained so much from that amazing experience! There was no way I was going to disconnect myself from something that brought so much good into my life! So here I am, welcoming regular and new yogis into classes led by amazing instructors. To add to that, I get to be one of those students from time to time. I’d call this part of my story at Bella Prana “Happily ever after” !